Gair Rhydd (Free Word) is the newspaper of Cardiff University’s students with a potential audience of nearly 29,000 readers all expecting to read a paper which can cover local and international news, provide incisive commentary on a range of social and political issues and cater for the lighter side of college life. 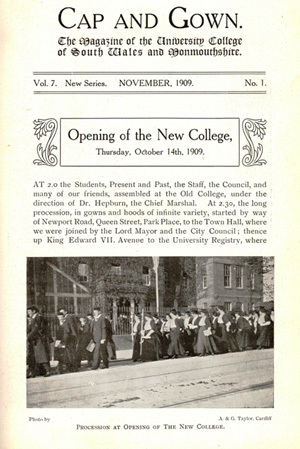 It was partly the success of Gair Rhydd and the realities of life as a modern student, which made me consider, as we approached the centenary of the beginning of World War One, how the Cardiff student of 100 years ago communicated and dealt with the life changing events which began in 1914. For scholars of a century ago Gair Rhydd was Cap and Gown – the magazine of the university college of South Wales and Monmouthshire (As Cardiff University was then known). I am not one who greatly cares for experience, soap…or a graduated income tax. A terrific satire lampooning the narcissistic tendencies of privileged youth? Probably, but one can’t entirely discount the possibility that Cardiff was nurturing its own prototype Morrissey. Prof: So you had two more days of grace did you? Student: Well, sir, not exactly two more days of Grace; her name was Phyllis. I was a little surprised by the lack of reference to rising tensions in Europe , but the fact that the issues which concerned, or didn’t bother, the student body of a 100 years ago are replicated so similarly today was oddly reassuring. How would things change by the next issue of December 1914, the war being underway for 4 months? But not for this student the deferential attitude to war poetry that shapes our attitudes to WW1 nowadays: we are told that, and remember this is Cap and Gown from 1914, ‘no fewer than 17, 643, 279 war poems have appeared in newspapers and periodical since the war commenced’. Newspapers are the subject of much derision – ‘possibly more terrible than the war are its results: among them, the newspaper accounts. The newspapers hash up the same news day after day and you decide to give up taking any until you remember how useful it is as a firelighter.’ This is truly remarkable given the existence of the Defence of the Realm Act which forbade the publication of material expressing criticism of the war effort. But the war had truly come to University college of South Wales and Monmouthshire in December 1914. There appears a list of students past and present who have enlisted for the war…but, the point is made, ‘though no effort has been spared, it has been difficult to find the names of past students who have joined the colours’. Even with this caveat there are 129 names listed. This is December and war broke out in August. We learn of Wilf Watkins once a lecture of education who, having enlisted, went to France and was wounded in two places by shrapnel. Cap and Gown reports, ‘he is now fortunately on the high road to recovery, so much so in fact that he has taken unto himself a wife’. Undeterred by his experiences, ‘when fully recovered he hopes gain to take his place in the regiment’. And amidst all this is a pithy epistle to the ‘freshers’ from a seasoned undergrad, the message of which seems to predate the summer of love and the hippy 60’s by some 50 years. The thrust of the advice can be can be adequately described thus:’ be ye not troubled, take things as they come. Above all things, be cool’. I was moved by the simple prophecy of these lines, ‘for our subsequent fortunes we must politely refer you to the newspapers, perhaps the casualty lists in particular’. It was not even 1915.